Welcome to another installment of The Hour Cosmic, your favorite comics game show! This week, our guest is artist and writer Jeremy Dale! – How we know our ABCs! – The “hugely popular” Foolkiller! – The art of being a Con exhibitor! Let’s meet our guest, shall we? Jeremy Dale is an creator living in Atlanta, Georgia. He is currently writing and drawing “Skywar,” a creator-owned property for Action Lab (check it out on Comixology as well! ), but he has done a ton of other comics work, including penciling “G.I. Joe: Real American Hero,” writing and drawing for “NFL Rush Zone” (! ), and having a piece in the “Popgun” anthology via Image. You can find him at just about every Con (He did 13 this year. THIRTEEN! ), on Twitter, on deviantArt and on his website. Chad Bowers – South Carolinian, GI Joe enthusiast, co-writer of “Subatomic Party Girls” “Down Set Fight,” and “Awesome Hospital” with Chris Sims, and writer of “Monster Plus.” He teaches us cool expressions like “Oh, snakes!” and has a lot of opinions about barbeque. Matthew Meylikhov – Bostonian, cat and beard enthusiast, co-writer of “Detective Space Cat” with Colin Bell, writer of “Morning Glories Babies,” “Morning Glories Academy Study Hall” (both backmatter for the Image Comics series “Morning Glories“) and “Control,” and letterer extraordinaire. He reads more comics than anyone on the planet, and has sworn off White Castle for life. Brian Salvatore – New Jerseyan, New York Mets enthusiast, host of “Input/Output,” a music podcast, and occasional blogger/freelance writer. He has never met a dog he didn’t like (even that one that bit his leg when he was 10), and has baked better bread than he ever thought possible. You can interact with the show in all sorts of ways – first of all, please rate, review and subscribe to the show in iTunes. You can email us at thehourcosmic@tellmesomething.org. You can follow the hosts on Twitter – @chadbowers, @mattisnotarobot, and @brianneedsanap – and while on Twitter, make sure to use the hashtag #TheHourCosmic – or tweet the shot directly @thehourcosmic. You can check out our website at thehourcosmic.com, as well as the websites of our corporate overlords at multiversitycomics.com and tellmesomething.org. We, like your mom and that weird kid from high school, are on Facebook, too. Our amazing announcer is Ken Beck – follow him on Twitter and check out his Tumblr. You can check out all of the other great comic shows on the Comics Podcast Network, and you can listen to us anywhere via the Stitcher app. Chad Bowers has been reading comics for most of his life. His transition from fan to professional is a work in progress. Heâ€™s the co-founder of ACTION AGE COMICS, creator of the webcomic MONSTER PLUS, co-creator of AWESOME HOSPITAL, THE HARD ONES, and DOWN SET FIGHT (coming soon from Oni Press) with Chris Sims. He reviews comics, writes G.I. 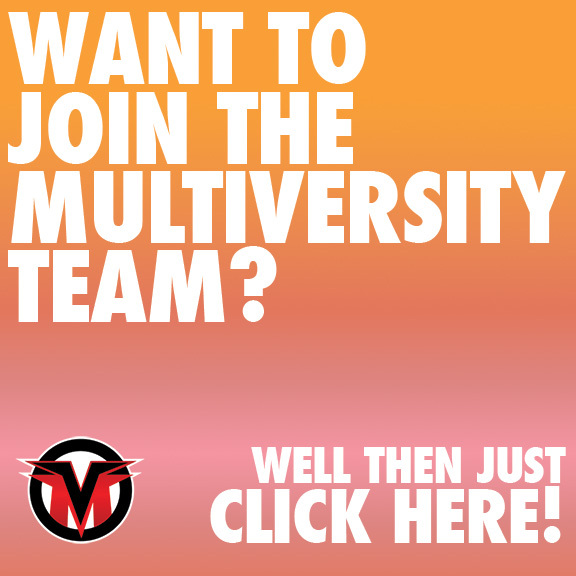 JoeVersity, and co-hosts The Hour Cosmic for Multiversity Comics! If you've got nothing better to do, you can follow him on Twitter or Tumblr.